Between 1999 and through 2002 during the breeding season research on the population is done towards Great Ringed Plover and the Kentish Plover in the delta area. The research was in collaboration and under supervision of the RIKZ. The fieldwork is done in a large number of areas in the delta area in Zeeland and Zuid-Holland. This study was aimed at reproduction, survival, dispersal & emigration. In the context of this study on the Great Ringed Plover 437 nestlings and 112 adults were ringed in total. Of the Kentish Plover in this period 302 and 164 adult breeding birds have been ringed. The adults were fitted with a colour ring in addition to the metal ring. Of the nestlings of the Great Ringed Plover 56% is colour ringed and for the Kentish Plover 66%. White coded ring with a combination of 2 numbers and /or 2 letters. Very few birds will be alive from this project. Observations on colour ringed Great ringed Plover/Kentish Plover can be reported to Pim Wolf. During this study on the Great Ringed Plover the total number of nests found was 571. In terms of breeding success between years there are no significant differences. However, the calculated breeding success between 1999-2000 is much higher as opposed to 2001 and 2002. The number of fledged young per pair decreased in the period 2000-2002. The average for the fledged young is 0.48 young per pair per season. The breeding season of the Great Ringed Plover is very long, eggs are being laid from the end of March until the beginning of July. Successive nests and second broods are observed regularly. For the Kentish Plover 558 nests were found during this study. The hatching success varies from year to year. In 2000 it was significantly lower as opposed to other years. Also the fledging success varies in the period 2000-2002. The average fledging success is 0.29 young per pair per season. The breeding season of the Kentish Plover shows a clear peak, at the beginning of May most of birds start laying eggs. Successive broods and second broods are hardly noticed at all. 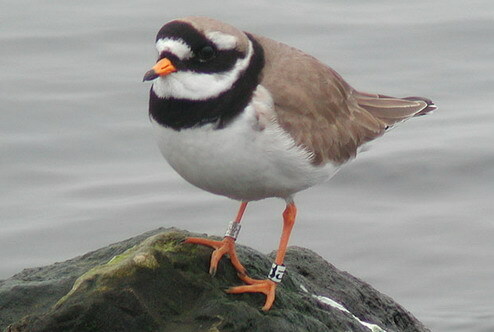 312 colour ringed Great Ringed Plovers have been used for the survival analysis. The average survival of juvenile Great Ringed Plover in the period of the breeding season 1999 until breeding season 2002 is 32.1 ± 6.4% per year, versus 74.1 ± 4.5% for adults. Differences between male and females were not significant. The oldest observed breeding bird was 17 years minimally. In case of the Kentish Plover 302 colour ringed individuals have been used for the survival analysis. The average survival of juvenile Kentish Plover in the period of the breeding season 1999 until the breeding season 2002 is 22.2 ± 5.9% per year, versus 72.4 ± 5.0% for adult birds. Differences between male and females were not significant. The oldest observed breeding bird was 15 years. Dispersion is analysed by means of re-readings and emigration by means of a multiple strata analysis. The dispersion and emigration of the Great Ringed Plover is smaller than for the Kentish Plover. The dispersion and emigration of the first year birds is for both species larger than in the case of adult breeding birds.